The Garden Path quilt block is an interesting geometric pattern that contains only simple shapes -- the square and half square triangle patches. However, this could be considered to be an intermediate level pattern due to the large number of pieces required to complete the quilt block. Nothing is difficult about this block other than the need for real precision in your seam allowance so that the pieces fit together. Don't hesitate to try making this block -- just take care with your piecing. 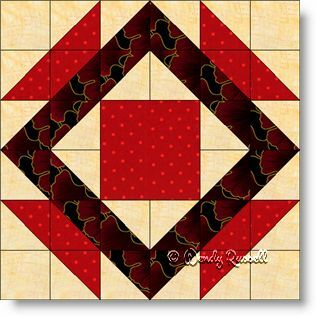 By varying the quilt block setting, and perhaps the number of blocks for your quilt, you can see how this one simple block can create very different quilts.